My first time in New Mexico would’ve been back in the ’90s, driving east, back to the Midwest. It was a fast shot. Across I-40 over the course of a day. I was still high from my visit to the Grand Canyon the day before, so I was a bit out of it. It went fast, and before I knew it, I was in Texas. It wasn’t until I cam back a decade later to Santa Fe and Albuquerque. That’s when I got a little taste of the place. The food, the grit, the new age wizardry, the clash of cultures, Route 66…all mixed up into one big bowl of green chile stew. And damn, I want to go back. Someone call me! I’ll come speak in Albuquerque and blow ‘em away! Home of Flake Music/Shins! C’mon! 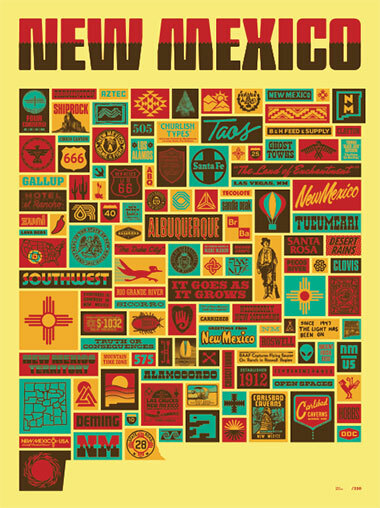 We made a poster for you, New Mexico! 01. Printed on thick, durable, French Pop-Tone Banana Split” 100# cover stock! 02. Four colors! Inspired by red peppers and turquoise rocks of New Mexico! 03. 18” x 24” in dimension. That hit of “Totally Turquoise” turned out incredible. 04. Proudly printed by the crystal wizards at Vahalla Studios! 06. Does the job for that Taos ski lodge, Albuquerque “Doghouse Drive-In” break room wall, Tucumcari lean-to, Los Alamos nuclear lab, Roswell alien chamber, Las Cruces apartment wall or Carlsbad Cavern gift shop. 07. Dedicated to buddies Andrew Campo and Marc Maron, and while we’re at it, Walter, Jessie and Hank.